Have you ever been on Main Street and wonder why people are dressed up in Minnie’s signature polka dots or why there are girls dressed in Snow White’s usual blue top and yellow skirt, complete with the red bow? It’s Disneybounding. 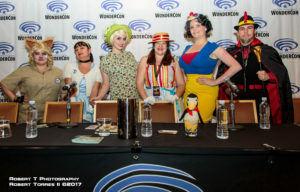 Coined by Leslie Kay in the early 2010’s, Disneybounding is the work around for adults to dress up as their favorite Disney characters and trademark IP without violating the “no costumes” rule. Disneybounding has grown in the past few years and has spawned dress up days in the parks such as Villains Day, Pokemon Day, etc. 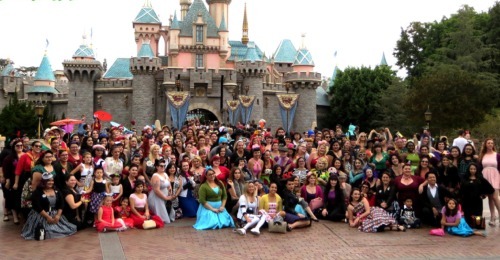 Learn more and get inspired at Scarlet Rhapsody’s Disneybounding 101 panel. This panel is recommended for cons with a Disney presence. We do invite people within the Disneybound community to collaborate. Please email us as scarlet.rhapsody @ ymail.com if you would like to collaborate for a future con. Photo by Robert T. Presenting at Wonder Con 2017.